The Syrian army on Saturday broke the Islamic State (IS) siege on the military airport of Deir al-Zour city in eastern Syria. The progress came after the troops advanced toward the airbase, which had been besieged by IS along with the city for three years, Xinhua reported citing SANA agency as saying. The troops, which broke the IS siege on the city earlier this week, reached the airbase and met with the besieged soldiers inside it. Capturing the airbase is a strategic win for the army in its quest to drive IS out of Deir al-Zour and its countryside. When the base was besieged, the soldiers could not fly warplanes as IS would target them. Now, the base is expected to return to operation after the army has cleansed the vicinity of the airbase. A Syrian officer told Xinhua by phone that IS was collapsing in Deir al-Zour. 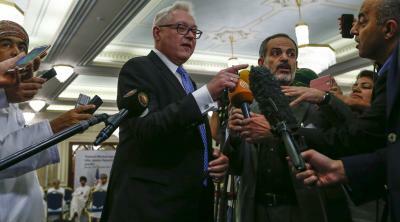 Syrian Foreign Ministry said the war on IS is close to the end given heavy defeats the terror group is suffering.